Civil society continues to push and pave the way for policy action on industrialized animal agriculture within the UNFCCC, even with the continued negligence of negotiators, ministers, and other policymakers to practically address the role of the livestock sector in climate change (contributing at least 14.5% of global anthropogenic greenhouse gas emissions). Multinational food and agriculture corporations are often lauded at these conferences for their sustainability efforts, usually based on intensification, increased efficiency, new technologies, and (vague) offset plans, aka business as usual. It’s important to continue to challenge false solutions and “greenwashing” by governments, public institutions, and corporations while also promoting alternative, holistic solutions that address GHG emissions, human rights, equity, animal welfare, and food security. Brighter Green has initiated events and engagement on animal agriculture and climate change at most UNFCCC conferences since COP15 in Copenhagen in partnership with several organizations, including Humane Society International (HSI), Global Forest Coalition (GFC), World Animal Protection (WAP), Compassion in World Farming (CIWF), Chatham House, EAT Initiative, Action Aid International, Réseau Associatif pour la Protection Animale et le Développement Durable (RAPAD), Association de Défense des Animaux et de la Nature, Friends of Siberian Forests (FSF), Indigenous Peoples of Africa Coordinating Committee (IPACC), Pan African Animal Welfare Alliance (PAAWA), Africa Network for Animal Welfare (ANAW), International Federation of Organic Agriculture Movements (IFOAM), Centro de Estudios e Invetigaciones de Derecho Rural y Reforma Agraria (CEIDRA), Green Belt Movement, International Fund for Africa, La Vía Campesina, Confédération Paysanne, A Well-Fed World, Physicians Committee for Responsible Medicine, Don’t Eat Friends, and Dupoto Community Forest Association. We continued this work in Bonn by coordinating a discussion on animal agriculture and climate change, leading a side event at the 13th Conference of Youth (COY13), and participating in two official side events at COP23. One of our goals for COP23 was to reach out to and connect with groups and individuals working on animal agriculture from multiple sectors, as the scale of the problems demands a diverse alliance. Along with The Johns Hopkins Center for a Livable Future, we organized a strategy meeting at the conference venue with people with various expertise and entry points, including environment, nutrition, soil science, policy, animal welfare, biodiversity, and research. We were pleasantly surprised by the high turnout for the meeting (nearly 30 people), and along with the increased visibility and participation of those working on these issues within and outside of COP, shows how momentum to address animal agriculture and climate change is building. Perhaps the most hopeful contingency for moving animal agriculture into the UNFCCC spotlight is youth. We were very pleased to be part of the program at this year’s COY, which is a gathering of international and regional Youth NGOs, civil society actors, and other young climate activists that takes place each year before the COP. This year, delegates came from 114 countries. I, along with Zhu Qing and Xinyi Lin from our “Good Food China” network, led a workshop, “What’s at Steak?”, on climate-friendly food systems, highlighting our work in China. The presentation was well-received and discussions about the topic continued throughout the weekend and at the COP itself, including at Brighter Green’s exhibit booth. The talk was covered by Youth Press Agency in both English and Italian. At the COP, we partnered on a side event with Global Forest Coalition, Institute for Agriculture and Trade Policy, and Friends of Siberian Forests addressing livestock, biosequestration, and forests. The panel examined how climate policies in the livestock and forest sectors are not only interrelated, but will determine whether the world’s countries forge a 1.5 degree Celsius warming pathway without compromising environmental integrity, food security, and human rights. Li Li, also from our Good Food China network, spoke about the importance of changing food systems in China (away from a Western “model” of high consumption of animal-based foods), the negative impacts of industrialized meat, and our programs on food systems and sustainability (including the Good Food Hero Summit), as well as the growth of veganism in China. You can watch a livestream of the side event here. We also participated in a second side event organized by the Israeli NGO, Green Course, on promoting plant-based diets as a climate action with significant co-benefits. Since the event was held in the Indigenous People’s pavilion at COP, I addressed our collaborative work with the Global Forest Coalition on deforestation and land-grabbing for animal feed and cattle production in South America, specifically Paraguay, and how this has displaced and marginalized countless indigenous and forest-dwelling peoples. Xinyi also spoke on the panel about eating patterns in China and the benefits of adopting a more traditional, plant-centric diet. Some content from this event was included in an article for The Ecologist. 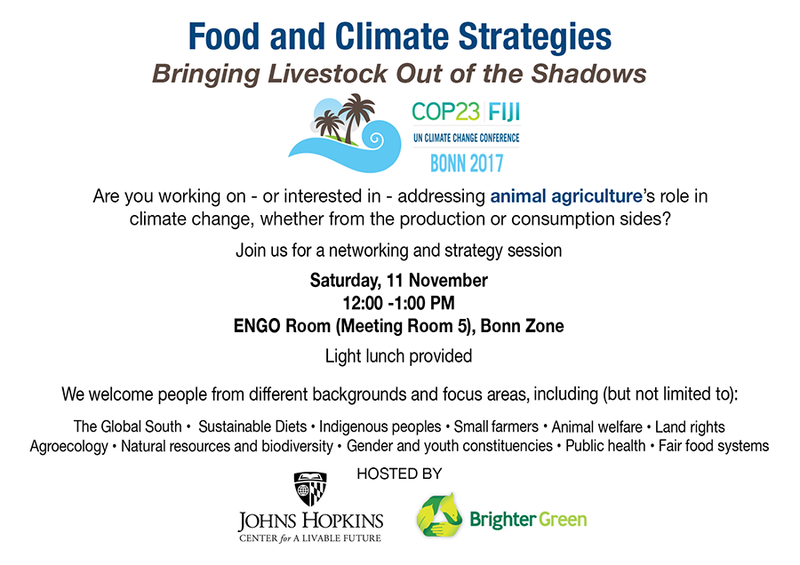 Another side event organized by Green Course and ProVeg International, “Reducing Livestock’s Long Shadow,” also promoted plant-based eating for health and climate change adaptation and mitigation. Panelists discussed the importance of animal-to-plant protein shifts and how, together with practical policy-based solutions, large changes in the livestock sector could help support the goals of the Paris Agreement. Several members of the Israeli government’s official delegation attended this side event, including Green Movement co-chair Yael Cohen Paran, the first member of the Knesset (Parliament) elected from an environmentalist party. She spoke briefly about the importance of addressing dietary patterns in the climate change negotiations. You can watch a livestream of the side event here (skip to the 14:30 mark). In addition to side events, two press conferences on the same day featured animal agriculture and climate change from a scientific and health perspective. First, Less Meat Less Heat launched the Put Climate on Pause Coalition with Professor Robert Howarth of Cornell University, calling on the UNFCCC to adopt a dual-term 20 year (GWP20) 100 year (GWP100) greenhouse gas accounting standard across all of its activities, including IPCC reporting, to highlight the impacts of SLCPs (short-lived climate pollutants), including methane and nitrous oxide from agriculture. These gases are rarely mentioned throughout climate change negotiations, but have significant global warming potential (GWP), and largely come from the livestock sector. The next press conference hosted by the University of California Los Angeles (UCLA) Institute of the Environment and Sustainability, featured Dr. Cristina Tirado-von der Pahlen announcing her new discussion paper, “Sustainable Diets for Healthy People and a Healthy Planet”, along with Dr. Cristina Romanelli of the Convention on Biological Diversity (CBD) and Dr. Elaine Fletcher from the World Health Organization. The paper and panelists highlight the importance of increasing plant-based food consumption worldwide, and lowering animal-based food consumption in high consuming countries for public health, food security, and climate. You can watch the livestream here. One other space included significant coverage of food consumption, especially meat and other animal products, Nordic Food Day, an all-day programming theme in the Nordic Pavilion. BBC Food Programme’s Dan Saladino moderated a number of different panels, including EAT Foundation president and founder Dr. Gunhild Stordalen and our colleague Erin Biehl, Senior Program Coordinator in the Food System Sustainability and Public Health Program at Johns Hopkins Center for a Livable Future, among others. Insect farming, clean meat, and everything in between was discussed and debated in this informal setting. But an overarching talking point was the need to move to plant-based diets in developed countries as a climate action. The next intercessional meeting is April 30 – May 10, 2018 in Bonn, Germany, followed by COP24 December 3-14, 2018 in Katowice, Poland. Call for Participation in Voluntary National Reviews!